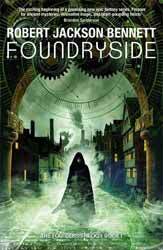 Foundryside (2018. 503 pages) is a new fantasy series from Robert Jackson Bennett. The story is set in a renaissance type city, which is ruled by four great merchant houses. Indeed the city is so controlled by these houses that the city is physically broken up into four walled areas; the poor live in the areas which separate the merchant houses domains. The city has no overall police force and few laws, making life both cheap and expendable. Gregor does not agree with this and his quest for justice for all means that he has created a force of men who guard the docks, Sancia’s natural enemies. The book and story rely heavily on the reader understanding what scriving is and a lot of space is devoted to this as it underpins both what is currently happening in the story and the history of the civilisation. Scriving is a way of marking something so that it behaves a particular way. For instance you may attach a scrived plate to a door so that it will only open in some very specific circumstances. Because Sancia can hear the scrivings, so can we the audience. In reality the language of scriving is not dissimilar to computer code, although it also appears to imbue the object with a modicum of intelligence and understanding. When Sancia pick up Clef, the key she stole, she understands that it is something much more. It does not possess the limited vocabulary of an object, but talks like a person, also it is not limited to obeying one set of commands but seems to be an autonomous intelligence. If its value was in doubt, then the fact that everybody connected with the key is being killed convinces her to go on the run. So, Sancia finds herself not only on the run from Gregor who wants to catch her for the theft but also from assassins. I really liked this first novel of the trilogy. Bennett has woven together a relatively rich backstory in which to set his tale, only revealing enough to make you want to know more. The world building was a little sparse as we learn a lot about how the city works but not a lot about the surrounding environment; this may change in the next two novels. What really works is the relationship between Clef and Sancia, both damaged and both trying to do the right thing. There is an undertone of a discussion about what it is to be an object. Clef, being a key is defined as such by almost everyone he meets, whereas Sancia, because of her past as a plantation slave as well as the uneven power distribution in the city, struggles not to define herself as an object, even though many of those who meet her treat her so. The book also talks a lot about freedom, freedom of self-determination, often against the mores of your society or the station of your birth. On the surface the book may seem to be just an exciting series of heists, but dig a little deeper and there is a richer vein to mine.